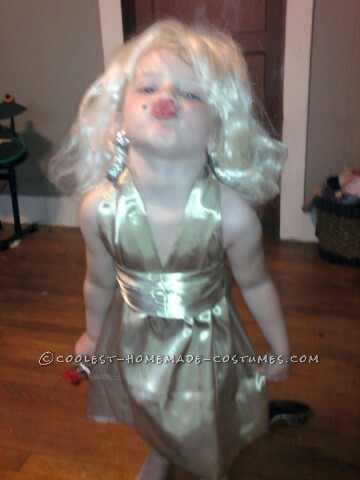 Cutest Little Marilyn Monroe Costume - Won Three Costume Contests! Cutest Little Marilyn Monroe Costume – Won Three Costume Contests! Needed something different, a sure winner for a costume contest and this was it, cutest Little Marilyn Monroe costume. The wig was a long cheap wig that was very knotted they we found in my daughters dress up bin. With the snip of the scissors, we had the perfect wig. The earrings were found at a local thrift store, I just wanted something big and shiny. This costume proved to be very easy to make. No patterns, not even a sewing machine. The dress itself is made out of a set of satin pillow cases. One became the skirt, trimmed to the right length and tightened at the waist. The second pillow case was bunched and draped over the shoulders it is pinned into the skirt and extra material is trimmed. The remaining pieces of material were used as the waistline. It was bunched, raw ends turned under, and hide all the raw edges underneath. The back of the waist trim was hot glued in place. Just a mole and she was ready to go. Slipped over her head nicely and she actually wore it to three different contest that year, which she won all of them.